Summary: Aliens(?) arrive one night on earth, infecting life forms and developing off...or in them. First Impression: This one's going to be a wild ride. Action seems to be a feature...but not the core? Which feels strange. The first episode spends most of its time world-weaving and fleshing out the characters a fair bit. Personal Opinion: I'm already deeply interested. This seems rather unique, not only in the realm of Aliens in anime, but also in feature parasites, and the way the main parasite behaves and acts. It leads me to suspect this is going to feature a very strong Human Interest element. Possibly intrigue but...this doesn't feel like the kind of show that would deviate to that, nor the kind that would reveal intrigue as one of its elements in the first episode. Despite featuring a rather well detailed action scene, it's presence almost at the end of the episode is very refreshing. I am ever so tired of the philosophy that we all need to be fish-hooked in the first 5 minutes with action or we can't be bothered to pay attention. I wish it would hurry up and die out, but ultimately, that's something that will only happen when a lot of people want it to. As it is, this show still played a Horror-hook in the opening scene. While rarer than an Action-hook, and as such a bit novel and interesting still, it's the same idea. Assuming gore doesn't bother you. It has a lot of that, it seems. Also, really really weird mutations and stuff all the time when the parasites are involved. 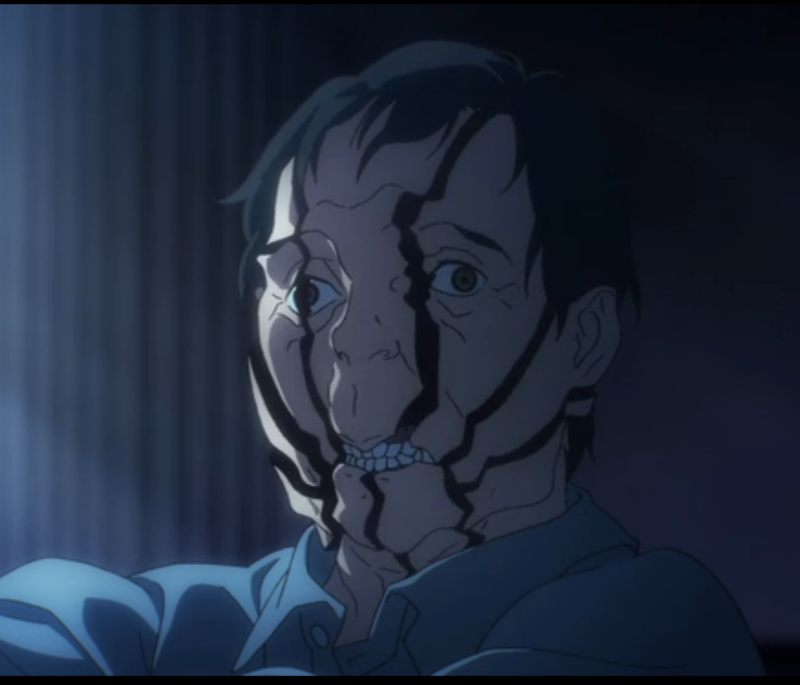 If the 'Uncanny Valley' and it's effects bother you too much, this show is going to mess with you. Loved the manga. I have high hopes for this one. Ooo...this has a manga? *thumps head* right. Most anime do. Good to know, let me just...put it...on my list...good. Now if the anime cuts off early, I can get the rest of it.